When we returned home after a long trip away from the farm, I rushed to the veggie patch to see what we could have for dinner (I also admit that it was the first and only thing I wanted to lay my eyes upon after that strenuous journey!). 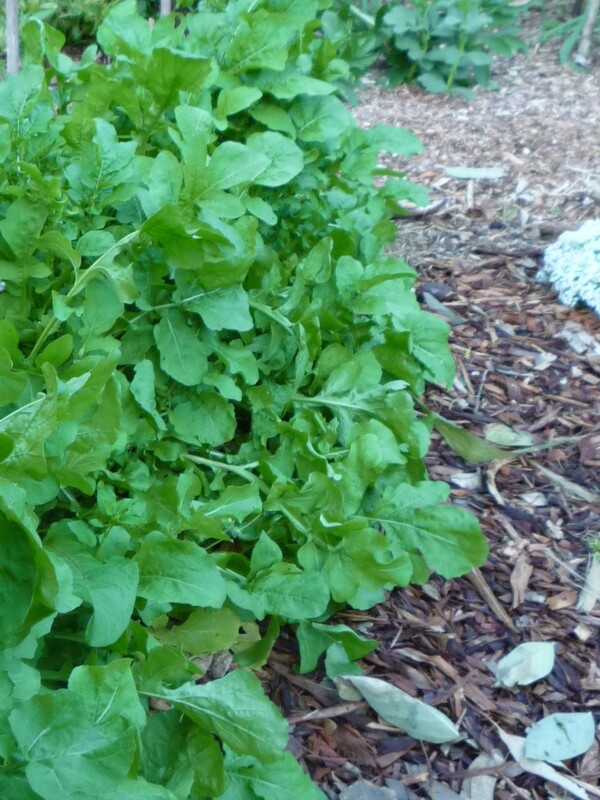 Greens are coming out of our ears – rocket, kale, lettuce, coriander, celery, parsley. The carrots have germinated and are coming up nicely, albeit not in great number. Peas are fruiting and broad beans too. A big disappointment on the beetroot front – not one came out. But the French radishes are getting ready to plump up their crisp roots and the cabbages are laughing with all that rain! I know the white cabbage butterfly will come when the weather warms up so I trust my cabbages will form a nice round head before these hungry caterpillars come in Spring! The scrumptious white sweet potato was ready for harvest (but the bush rats made a meal of them) and pumpkin will need to be gathered from the patch. There are still mountains of Jerusalem artichokes to harvest. The bananas we harvested a few weeks ago have ripened (we hung the bunch on a beam in our dining room!) very decorative indeed, and the passion fruits are ripening on their vine. So, without strenuous efforts, the garden is giving us all that food. It has been designed around the theme of “the veggie patch will be cared for by a time-poor lazy gardener (me!)”. And so far it works! When will you have yours?